We have already hosted on several occasion the Italian cassette / digital outcome Prehistoric Silence, surely one of our favorites when it comes to sound art, underground experimental ambient and noise music. The last PHS outing after the summer was They Are Eating All The Faeries by the youngster Coeden. Its follow-up, namely the sixth entry in the catalog, is but another album debut recorded by the Italian producer Samuele Larese aka Lessons In Hate. We’re glad to present you the Stairs of Emotion EP, a blurred selection of noisy soundscapes split into four separate moments. Releasing on tape and digitally this Friday, November the 9th and available for pre-order at this link, the EP gathers multiple atonal sound textures clouded with a workload of feedbacks. To produce his first release as Lessons In Hate, the Italian artist has used a rather minimal equipment composed of a Korg MS-20, a bunch of effect pedals, and a rich collection of field recordings. All the sound material appearing in the EP, counting up to a total of 18 minutes or so, has been recorded in the previous year lapse and has undergone an aggressive editing process, adjusting to the feeling of overwhelming depression which erupts from the record. As the moniker (inspired by an Avian record which now seems inexplicably ancient) would care to suggest, Lessons in Hate carefully casts suffering on the listener via intensive, abrasive compositions deploying both vicious industrial soundscapes as well as fragile tides of harmonies. Stairs of Emotion is reportedly a record about “love, hate, and confusion” which dwells in remote, nostalgic feelings, recalled again an again on an endless pattern of repetition towards oblivious annihilation. 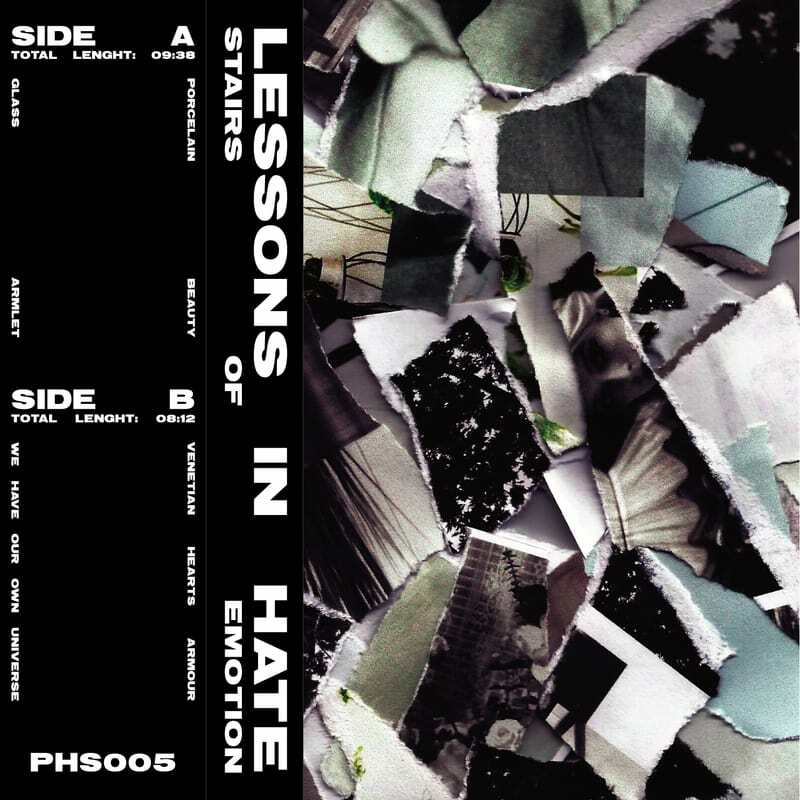 The tape is recorded and mixed by Lessons In Hate, mastered by Antonio Gallucci. Get your own copy at this link.